Since March 2011 the Off-Highway division of Detroit Diesel Corporation, MTU Friedrichshafen, Bergen Marine, Rolls-Royce are under control Rolls-Royce Group PLC, Daimler AG and Tognum AG. 176001 Detroit Diesel Detroit Diesel engines Series: 149, Inline 53, V53, 60, Inline 71, V71, V92 - MODEL DESCRIPTION and SERIAL NUMBER LOCATION. Free download. 176101 40E series Detroit Diesel engine 40E - Service (repair) manual, Operators Manual, Service Information Bulletins, Service Letters, Modification Bulletins. 176121 50 series Detroit diesel engine 50 series - Operator's Guide. Workshop (Service) Manual. Service Information Bulletins. Service Letters. Modification Bulletins. Support Information. 176122 50 series Detroit diesel engine series 50 Custom Spare Parts Catalog. Inform serial number of the engine. 176123 50G series Detroit Gas diesel engine series 50G Natural Gas Troubleshooting Guide. 176141 53 series Detroit diesel series 53 Operator's Guide. 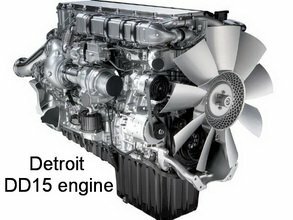 176142 53 series Detroit Diesel Series 53: 2-53 (2 valve), 3-53 (2 & 4 valve), 4-53 (2 & 4 valve), 6V-53 (4 valve), 8V-53 (4 valve), 53N, Turbo models, Turbo Silver models, Turbo Silver Intercooled models for Marine, Industrial & Vehicle applications - Service (workshop) Manual (840 pages). Service Information Bulletins. Service Letters. Modification Bulletins. Support Information. 176143 53 series Detroit diesel 53 series Spare parts Catalog. 176145 53 series Detroit diesel engine series 53 Custom Spare Parts Catalog. Inform serial number of the engine. 176155 6V53N, 6V53T Detroid Industrial engines 6V53N and 6V53T Specification sheet. Free download. 176161 55 series Detroit diesel series 55 Workshop (Service) Manual. Service Information Bulletins. Service Letters. Modification Bulletins. Support Information. 176183 60 series Detroit Series 60 Diesel - Service (repair) Manual. Service Information Bulletins. Service Letters. Modification Bulletins. Support Information. 176184 60 series Detroit Series 60 Diesel, Natural Gas-Fueled, and Marine Diesel - Service (repair) Manual. 2117 pages. Service Information Bulletins. Service Letters. Modification Bulletins. Support Information. 176185 60 series Detroit Series 60 Diesel and Natural Gas-Fueled Engines - Service (repair) Manual. 1669 pages. Service Information Bulletins. Service Letters. Modification Bulletins. Support Information. 176186 60 EGR series Detroidt Series 60 EGR Engine - Technicion's Manual. 195 pages. 176187 60 series Detroit EPA07 series 60 DDEC VI Troubleshooting Guide. 925 pages. 176188 60G series Detroit Gas diesel engine series 60G Natural Gas Troubleshooting Guide. 206 pages. 176189 60 series Detroit series 60 DDEC V EGR Engine Harness - DDEC V WIRING DIAGRAM. 176192 60 series Detroit diesel engine series 60 Custom Spare Parts Catalog. Inform serial number of the engine. 176193 60 EGR series Detroidt Series 60 EGR Engine - Service Experience. Free download. 176194 60 series Detroidt Series 60 Engine - Specifications. Free download. 176195 50 and 60 series Detroit diesel 50 and 60 series Construction & Industrial, and Marine Engines - Application and Installation Guide. 435 pages. 176196 50 and 60 series DDEC IV ON-HIGHWAY - EGR Application and Installation (include sensor failure CODE). 749 pages. 176197 60 series The 2007 version of the Detroit Series 60 Emissions. Free download. 176202 149 series Detroit Diesel engine 8, 12, 16, 20 V149 series Service (workshop, repair) Manual. Service Information Bulletins. Service Letters. Modification Bulletins. Support Information. 176203 149 series Detroid diesel series 149 Custom Spare Parts Catalog. Inform serial number of the engine. 176204 149 series Detroidt Series 149 Engine for Construction and Generator Set Applications - Data and Specifications. Free download. 176205 12V149 Detroidt Marine Engine 12V-149 800 hp - Data and Specifications. Free download. 176221 638 series Detroid diesel series 638 Workshop (Service) Manual. Service Information Bulletins. Service Letters. Modification Bulletins. Support Information. 176301 In Line 71 series Detroit Diesel engine 4-71 and 6-71 Maintenance (workshop, repair) Manual. 204 pages. Service Information Bulletins. Service Letters. Modification Bulletins. Support Information. 176302 In Line 71 series Detroit In Line 71 series diesel engine Custom Spare Parts Catalog. Inform serial number of the engine. 176303 2-71 / 3-71 Detroit Stendby electric Set Models 2-71 (40 kW) and 3-71 (65 kW) - Data and Specification. Free download. 176304 6-71T Detroit Generator Engine 6-71T 6 cylinder in line (289-330 hp) - Data and Specification. Free download. 176305 6-71NC / 6-71N Detroit Truck Engine 6-71NC and 6-71N 6 cylinder in line (240 hp) - Data and Specification. Free download. 176321 V71 series Detroit diesel engine V71 series - Workshop (Service) and Operation Manual. Service Information Bulletins. Service Letters. Modification Bulletins. Support Information. 176324 V71 series Detroit V-71 series diesel engine Custom Spare Parts Catalog. Inform serial number of the engine. 176325 12V-71 / 12V-71T Detroit Generator Engine 12V-71 (300 kW) and 12V-71T (440 kW) - Data and Specification. Free download. 176326 12V-71TA Detroit Diesel Engine 12V71 TA (7123-7406) 640-750 hp - Data and Specification. Free download. 176341 92 series Detroit diesel engine V92 series - Workshop (Service) and Operation Manual. 756 pages. Service Information Bulletins. Service Letters. Modification Bulletins. Support Information. 176342 8V-92TA Detroit 8-cylinder turbocharged diesel engine 8V92TA - Maintenance (Workshop, Service) Manual including repair parts and special tools list. 554 pages. Service Information Bulletins. Service Letters. Modification Bulletins. Support Information. 176351 V71 / V92 Woodward EG-3P Actuator Installation on Detroit Diesel V-71 & V-92 Engines. Free Download. 176401 EPA04 MBE 900 Detroit diesel Engine EPA04 MBE900 Operator's Manual. 121 pages. 176402 EPA07 MBE 900 Detroit diesel Engine EPA07 MBE900 Operator's Manual. 162 pages. 176403 MBE 900 Detroit diesel engine MBE900 series - Service (Workshop) Manual. Service Information Bulletins. Service Letters. Modification Bulletins. Support Information. 176404 MBE 900 Detroit DDEC VI MBE900 - Troubleshooting Guide. 853 pages. 176405 MBE 900 Detroit MBE900 series diesel engine Custom Spare Parts Catalog. Inform serial number of the engine. 176406 MBE 900 Detroit diesel engine MBE900 - RV Reference Guide. Free download. 176421 MBE 2000 Detroit diesel engine MBE2000 series - Service Information Bulletins. Service Letters. Modification Bulletins. Support Information. 176422 MBE 2000 Detroit MBE2000 series diesel engine Custom Spare Parts Catalog. Inform serial number of the engine. 176441 EPA04 MBE 4000 Detroit diesel Engine EPA04 MBE900 Operator's Manual. 110 pages. 176441 MBE 4000 Detroid diesel EPA04 MBE4000 Workshop Manual. 631 pages. Service Information Bulletins. Service Letters. Modification Bulletins. Support Information. 176442 EPA07 MBE 4000 Detroit diesel Engine EPA07 MBE900 Operator's Manual. 158 pages. 176442 MBE 4000 Detroid diesel Series 4000-03 for PowerGen Applications - Data, Specification. Free download. 176443 MBE 4000 Detroit MBE4000 series diesel engine Custom Spare Parts Catalog. Inform serial number of the engine. 176461 MBE900 / MBE4000 Detroit Diesel (MBE900 - MBE930, MBE4000) MBE EGR Technician's Guide -Components, Modes, Troubleshooting. 122 pages. 176462 MBE900 / MBE4000 Detroit DDEC for MBE 900 and MBE 4000 - Application and Installation. 367 pages.